Delectable semi-sweet chocolate chips and buttery macadamia nuts are baked right into our classic home-style cookies. This irresistible treat combines two of our favorite ingredients for a rich, crunchy, highly addictive cookie. Our decadent Bite-Sized Chocolate Chip Macadamia cookies contain no preservatives and are made from the finest ingredients for the perfect Hawaiian style cookies you can eat any time. ・Box size: 5.5" x 3" x 3"
WHEAT FLOUR BLEACHED, MALTED BARLEY FLOUR, NIACIN (A B VITAMIN), IRON, THIAMIN MONONITRATE (VITAMIN B1), RIBOFLAVIN (VITAMIN B2), FOLIC ACID, MARGARINE (LIQUID AND PARTIALLY HYDROGENATED SOYBEAN OIL, WATER, SALT, WHEY SOLIDS, SOY LECITHIN, VEGETABLE MONO & DIGLYCERIDES, NATURAL FLAVOR (MILK), BETA CAROTENE (COLOR), VITAMIN A PALMITATE ADDED), GRANULATED SUGAR, WHOLE EGGS, MACADAMIA NUTS, PINEAPPLE FROM CONCENTRATE, ARTIFICIAL FLAVOR, BAKING SODA (SODIUM BICARBONATE). CONTAINS: SOYBEAN, EGGS, MILK, MACADAMIA NUTS. Kauai Kookie was founded in 1965 by Mabel Hashisaka. At the beginning, she baked cookies to satisfy a very basic need to provide an island-style dessert to serve at her father’s family business. 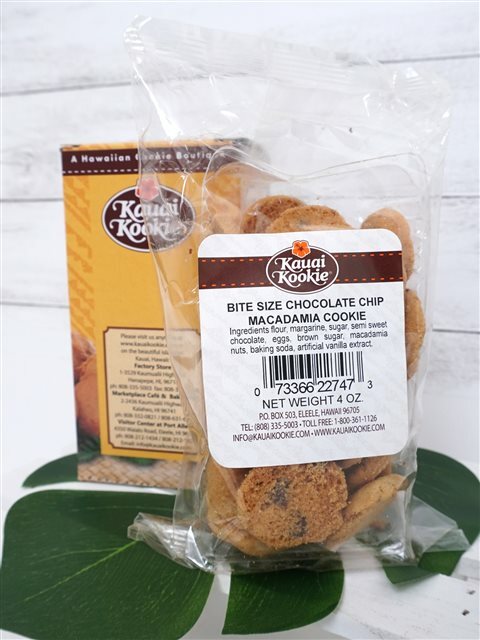 Kauai Kookies are the original cookies from the island of Kauai.Each of products is baked fresh daily using some of Hawaii’s finest ingredients including macadamia nuts, Kona coffee, and Kauai’s very own Makaweli poi among others to ensure you are purchasing a superior product. You can find our products in many retail outlets in Hawaii, the mainland United States, and overseas.